Do you need smart-looking decorations for dressing up your booth at expos or trade shows but have only a small budget to work with? In that case, just have your corporate logo printed on table runners. 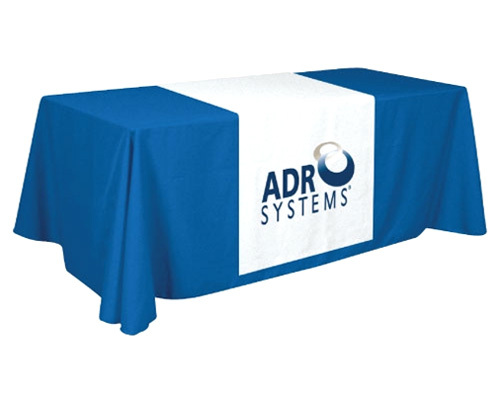 Professionally made tablecloths with a logo printed on it are effective advertising tools that let your customers know who you are and what products and services you offer. They also don’t cost much. Check out our printed custom table runners – they will help you get the word out about your company and still stick to your budget. When you order a tablecloth with logo from us, you are definitely buying a custom-made, high-quality product. For one, the fabric making up the table runner is 210gsm in thickness, much thicker than the tablecloths offered in the market. For another, the details of the printout are sharp and realistic while its colours are remarkably vivid and lifelike. That’s because we use dye sublimation in creating our printouts. Dye sublimation is the best fabric printing technology available in the market to date. It is known to produce colour-rich, accurate, and even lifelike printouts. Printouts produced using dye sublimation are permanent. In this particular printing process, a mirror likeness of the desired image is printed out on thermal paper. The thermal paper is then pressed on to the fabric medium using a special machine. The heat and pressure from the machine causes the ink on the thermal paper to transform from solid form into gas, completely bypassing the liquid form. As the ink sublimates, it permeates the fabric’s fibres, thus creating a permanent imprint. So your printed table runner will not fade even if you wash it or have it dry-cleaned. When you order a table runner from us, you get to have total control over its appearance. The table runner is customisable and you get to choose its design and colours. You can either provide us with the design you want or we can do the layout for you. To make sure that the colours will be accurate, we will ask you to give us the exact shade you want from the Pantone colour library, which is a book indexing the colours that the human eyes can see. Let’s say you want a blue table runner. You can pick out the PMS code for the specific shade of blue you want, whether it’s ice blue, sky blue, navy blue, cerulean, midnight blue, azure, turquoise, and so on. Above all, you have the option to request a sample print from us before we produce the final product. Doing so will guarantee that you will be getting what you paid for. Perhaps the greatest benefit you will get from having your corporate logo printed on our custom table runner is you will save money from it in the long run. For one, we only do full-colour printouts. You don’t have to deal with escalating rates according to the number of colours to be printed. We won’t charge you extra for full colours. For another, we don’t need you to place an order for a minimum number of table cloths. If you want just one, then we will give you only one. You won’t have to spend for product you don’t really need. Lastly, the end product is reusable. You can use it not just at expos and trade shows, but also at press conferences, corporate events and even as decor for your office. The colours will not fade. Our printed table runner is the best, cost-effective option you will find. It will help you come up with an impressive display without breaking your budget. Call us right now to find out more about this product.